Stereoscopic vision is essential for precise surgical performance and operative safety during laparoscopic and endoscopic surgery. 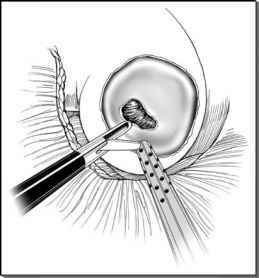 However, most current video endoscopic systems provide a two-dimensional, flat image. Recent advances in imaging technology allow the application of three-dimensional video techniques to laparoscopic surgery (Fig. 7). Most of the current three-dimensional video systems have four basic principles of stereoendoscopic image processing in common: (i) image capture, (ii) conversion of 60 to 120 Hz images, (iii ) presentation of left and right images on a single monitor, and (iv) separation of the left and right eyes images (29,30). A three-dimensional video endoscopic system captures two slightly different images of the operative field, which are then transmitted to the monitor so that the images of the right and left cameras are alternatively displayed (sequential display procedure) with a frequency of 100/120 Hz. Several image-capturing methods have been employed, including the dual-lens system, single-lens systems, electronic video endoscopic system, and a system of single rod lenses with two beam paths. The three-dimensional imaging display may be achieved by two methods, either active liquid crystal display glasses or polarizing glasses. In both instances, the brain fuses the right- and left-sided images on the appropriate imaging site. This technology is based on the physiology of retinal image persistence and is quite different from normal stereoscopic imaging (5). The presentation of the two images independently to the left and right eye is an alternative to dual projection. This technology is currently available as part of the da Vinci® Robotic System0. Head-mounted display technology may offer another means of delivering separate images to each eye without dual projection. FIGURE 7 ■ Three-dimensional stereoendoscope. Schematic diagram of three-dimensional video imaging system. The two images are projected on a screen, and the glasses bring the two together, giving the impression of a three-dimensional image. Alternatively, the separate images can be presented separately to the left and right eye through a head set. This is currently available as a part of the da Vinci® robotic system and can theoretically be developed via a head-mounted display. Abbreviation: 3D, three-dimensional. Source: From Ref. 28. Comparisons of two-dimensional and three-dimensional video systems have offered conflicting results in experimental and clinical practice. Despite the benefits of enhanced depth perception provided by three-dimensional systems demonstrated in various studies, three-dimensional endoscopic technology has not been widely used due to its high cost and relative lack of availability. Moreover, some studies have demonstrated no evidence of improved performance while using three-dimensional systems during endoscopy and suggest that a higher-resolution video system might be more advantageous than the three-dimensional endoscopic imaging (27,31,32). The three-dimensional imaging systems are currently used for true stereoscopic imaging during robot-assisted laparoscopic procedures (33-35).